Comet of the Century – A Horizon Special; Stonehenge: Walking Through History; Finding Babylon’s Hanging Garden: Secret History; Morecambe and Wise: the Whole Story - ( 1ND144 ) | Best Book "The Great Gatsby"
No Doctor Who here, I’m afraid. Well, there was a live blog on the Guardian’s site, plus everything else – that’s enough, isn’t it? This is Doctor-free then, absolutely safe to proceed if you’re allergic. No sport either, so this is probably the TV you didn’t watch over the weekend. Maybe you should’ve done though (and it’s not too late). Some of it was great. Comet of the Century – A Horizon Special (BBC2, Saturday) for example. A bit like Doctor Who, only for real: we’re having a close encounter from Out There. 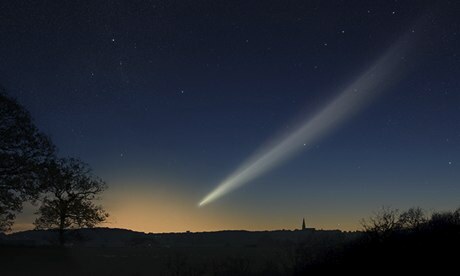 Getting on for 5bn years old, a frozen relic from our distant past, it’s a comet called Ison, and it will pass closest to the sun on Thursday, when it will be travelling at around 845,000 mph. Should be quite a sight – a big sparkly sperm in the night sky. But it’s not just about the spectacle. The way it behaves when it approaches the sun will tell us things about the formation of the solar system and the very nature of our origin – well, will tell dudes like Professor Jurgen Blum here, and he can do his best to pass it on. So if Ison explodes, for example, this will support his “peloton theory”, about how, in the beginning, dust clumped together, like cyclists, to eventually form planets. Basically, it might have all started as a big dusty bicycle race in the darkness, the Tour du Univers, and everything we know now came out of it. Apart from the Lance Armstrong special space dust, which had extra and unfair external forces, went faster than all the other dust, spun out of control, burned up, and was forgotten about. Maybe. Anyway, it’s a lot more complicated – and a lot more interesting – than Richard Hammond had us believe in his show the other day. This isn’t Top Gear astronomy, presenters buzzing about in boys’ toys, whooping. Professor Jurgen is a proper scientist. A keen cyclist himself, he pedals to work – at the Centre of Applied Space Technology and Microgravity at Bremen University – every day. The ride gives him time to think about the origins of the solar system, he says. Wow, those are proper going-to-work big thoughts, not the petty personal worries I have on my ride. But even if I don’t totally understand his peloton theory, I can at least see how it came about. In Stonehenge: Walking Through History (Channel 4, Saturday), Sir Anthony Robinson – yeah Baldrick – is at the centre of his universe. He’s got himself a serious pair of walking boots, and he’s hiking through neolithic Britain. Wiltshire in this one, which – with all its burial mounds, barrows and stone circles etc to snuffle about – is pretty much paradise for Tony. He starts at Windmill Hill, where early Britons first gathered, a bit like dust particles. They came together to buy and sell, to gossip, to meet partners perhaps – “a kind of prehistoric village square if you like”. No Tony, I don’t like: do you mean a kind of prehistoric internet? Come on man, nearly there, pull yourself that extra half-century or so into the present. And he ends up at the big one: Stonehenge. Actually disappointingly small, I always think, but then I didn’t have to lug those stones there. Anyway, it turns out it’s not aligned for the midsummer sunrise, but for the midwinter sunset. Bit of a blow for the druids. More seismic archeological shocks in Finding Babylon’s Hanging Garden: Secret History (Channel 4, Sunday), where Stephanie Dalley of Oxford University is saying that the horticultural wonder wasn’t built by King Nebuchadnezzar as previously believed. Nor was it even in Babylon. The green-fingered king was one Sennacherib, she says, and the site is further north, at Ninevah. Trouble is, it might once have been Babylonia in Bloom, or possibly Assyria in Bloom. (Does anyone else imagine Hanging Baskets of Babylon, petunias mainly, a bit twee? No? Just me then). Anyway, it’s now very much Iraq in Boom. Ninevah is modern day Mosul, where bombs are still going off the whole time, making archaeology by genteel Oxford ladies difficult. But, from the (relative) safety of Iraqi Kurdistan, Stephanie sends in a couple of locals with cameras. The outcome may not be conclusive, but it’s still absolutely fascinating. And Dalley is brilliant – posh and polite, brave, formidable, very English, all at the same time. Like a character from Agatha Christie. Plus she can read ancient cuneiform, of course. No great revelations or surprises in Morecambe and Wise: the Whole Story (BBC2, Sunday). Just a fond and thorough look back at Britain’s greatest double act, a ray of sunshine in a dark age of cynicism … shush. Lovely though, obviously.